Our Institute Artists are amazing musicians and we want to share their personal stories, musical insights, and passion for performance with you, so we asked each artist to answer some questions about what it is like to be a performing musician. 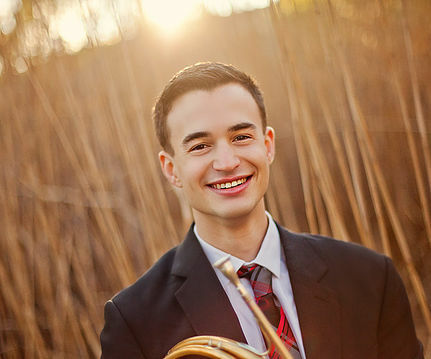 We hope you enjoy getting Russel Rybicki, our 2017 horn player! I had a year of piano when I was in elementary school, but never practiced and did not like it. I started in band in 6th grade on horn. What is your favorite piece to learn or perform? Why? I enjoy performing most things when the people I'm playing with are fun to work with. Some pieces that come to mind are Stravinsky's "Rite of Spring", Schoenberg "Chamber Symphony No. 1" and Beethoven's 3rd Symphony. Oh wow there are so many. I think my most memorable experience that comes to mind is when I was at Tanglewood last summer, and we were allowed to sit on stage during Boston Symphony rehearsals. They were freshening up Mahler's 9th Symphony with Andris Nelsons for a performance that week after taking it on tour the previous year. I got to sit right next to the horn section. I must have cried 4 or 5 times during that run-through. I have so many, but I'd have to say Gail Williams and W. Peter Kurau, my primary teachers in graduate and undergraduate school. Of the pieces that you are performing here in New Orleans, which is your favorite? Why? The Ligeti Trio. To be honest, I'm quite terrified because it is so intricate and everyone has to be so synced in to what's going on. But that is a thrill I love, so I am extremely excited to perform it. What instrument do you play and why do you continue to play it? Horn. I find it to be one of the most rewarding and liberating feelings to be able to play a musical instrument. The horn for me is a way to let go of everything around me, and just play music. It poses new challenges every single day, and I always have to be prepared to produce my best even when I don't feel it. Leonard Bernstein. He was such an influential figure in the musical world, and I would ask him so many things. I think it would depend on the piece, but I always wonder with conductors- especially great ones. I'd ask what does this piece means to you on a personal level? How do you bring that to life? Not particularly. My mom was a church cantor, and my dad loved to play classic rock on the radio all the time. Yes. Every time I perform. Without question. It took me a while to recognize that nerves are not negative. They are your body's way of responding to excitement of not knowing what's going to happen. Always realize you're part of something much bigger than yourself. It is never about you in music. It is about the collective and the art you create. Take risks. Miss notes. Congratulate yourself when you make a mistake trying to serve the music best. Don't be apologetic. It's not exciting to listen to. How long do you practice? When did you really learn how to practice? I usually find about 3 hours of my own practice time per day. This of course depends on how many rehearsals I've had or if I have a lot of playing at the end of the week. Brass playing can accumulate, so it is really about playing with efficiency and pacing yourself. I'm still learning to practice. I find it will always be a learning process, but to always be present in your sessions, and enter each time you practice as a performance laboratory where you can freely experiment. I always look to singers, pianists or string players for how to do many things on horn, so I think I'd pick people like, Cecilia Bartolli, Ian Bostridge, Gil Shaham, Mstislav Rostopovich, Marta Argerich, Vladimir Ashkenazy, and I'm sure there are more I'm not thinking of. Of course getting to play for Mozart, Beethoven, Brahms, Mahler, Strauss, or Schoenberg would be unfathomable, but I think there are so many great musicians to look up to for inspiration that I can't pick just one!